Hello! It’s lovely to be at Ex Libris today! 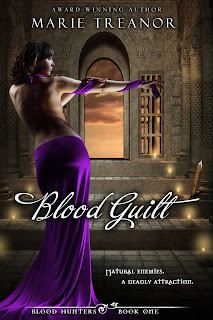 As you may know I’m celebrating the release this month of Blood Guilt, the first of my new Blood Hunters vampire romance series. Although Blood Hunters is a sequel series to the Awakened by Blood trilogy (Blood on Silk, Blood Sin and Blood Eternal), it should stand alone too. Anyway, Stella has asked me to talk today about the settings of Blood Guilt: the story opens in Scotland, moves to Hungary and closes in Malta. Why? It’s a vampire romance - isn’t the paranormal world exotic enough?? Well, not for me :-). I like to contrast my fantasy with reality, and for me, in this particular world, ancient and gothic settings work best. I have been to all three countries, and all have made a profound impression on me in very different ways. At first glance, you might think there’s no reason to choose Scotland – there are, sadly, no wild, kilted Highlanders running through this story. The truth is, I was born in Scotland and I still live here! 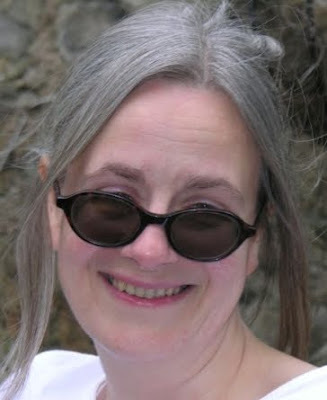 It’s second nature for me to write about Scottish characters and/or Scottish settings, and in the Awakened by Blood trilogy, my heroine Elizabeth is a Scottish academic. It’s also established in the earlier books that Maximilian, the vampire hero of Blood Guilt, isolates himself on an unknown Scottish island. So, in Blood Guilt, Mihaela is staying in Elizabeth’s flat to get away from her problems in eastern Europe. 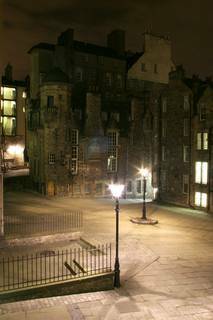 She chases vampires through the dark, narrow streets of Edinburgh’s atmospheric old town, where once Victorian body snatchers Burke and Hare, and infamous murderer Deacon Brodie committed their crimes. Trust me, it’s a natural setting for vampires :-). As is the cathedral ruin in St. Andrews and the damp, misty west coast island where Mihaela beards Maximilian in his lair and gets rather more than she bargained for. So, why then move things to Budapest? Well, again this is partly the fault of the previous story told in the Awakened by Blood books. Budapest is the location of the headquarters of the east European vampire hunters. And being a traditionalist, I made this region the most densely populated with vampires, making up the most powerful undead community in the world. Back at the beginning of Blood on Silk, I had Elizabeth waken Saloman in an isolated Romanian village, but Budapest is the biggest city in the region, where the vampires congregate for the biggest choice of human blood. 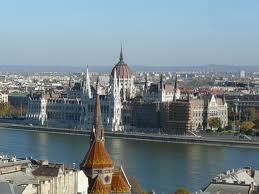 Did it have to be Budapest? Why not Bucharest in Romania? Or some other picturesque town? Well, I’ve been to Budapest. Many years ago, now, but it made a wonderful impression on me as a place of great beauty and contrasts. It has an appealing amount of Gothic charm, including a huge castle on the hill, plus all the vibrancy of a big city, and a long, varied history celebrated in various large squares and monuments. It’s also an incredibly picturesque city, perched on either side of the River Danube – although with its fair share of ugly high-rise flats in the suburbs. It seemed a perfect setting for my vampire overlord to make his power base, and for my hunters to run their organization. 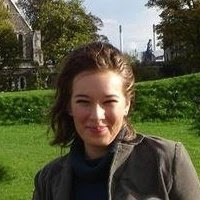 Although Mihaela is Romanian, she has made her home in Budapest, where her work is based. Then, on to Malta for the story’s climax. Why? Well, I wanted somewhere in the middle of the Mediterranean and – guess what? I’d been there :-) – twice. Malta is another fascinating place: a group of three small islands closer to Africa than Europe and historically of huge strategic importance. Everyone and his father seems to have invaded the islands at one time or another and the influence of all these cultures has left a wonderful mix. The island of Malta itself has the most spectacular harbour you will ever see, guarded by fortresses built originally in the sixteenth century to protect the island from Turkish invasion. 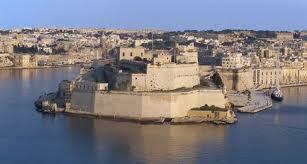 My family and I stayed in the same Valetta hotel where Mihaela and Maximilian stay in Blood Guilt. The view is so beautiful it could make you cry; and it was amazing to watch huge cruise liners sail into the harbour almost as if they were gliding up the street outside our window. The final fight scene of Blood Guilt takes place among the ruins of a prehistoric temple. 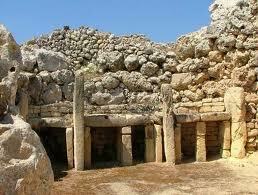 The islands have several of these, but I chose Ggantija on the second biggest island of Gozo. It’s an amazing place, eerie and ancient – older even than the more famous Stonehenge in England - with panoramic views around the island. The stones – of vital importance to the story of Blood Guilt - seemed to me to exude a mixture of peace and threat and a magic long lost to humanity. In other words, this was the perfect place for my evil vampires to work their terrible enchantments and be opposed by my hero and heroine. So, these are the main settings for Blood Guilt, which I chose from a mixture of familiarity and fascination, a sense of what was fitting and of what had gone before in my story. I hope I’ve managed to convey some of my love of these places to you. Have you ever been there? If not, which would you most like to visit? So tell us, have you you ever been to these three places? If not, which would you like to visit the most and why?